The terrible decline in the Caixin PMI index from 49.7 in December to only 48.3 in January shows just how important it is for China and the US to secure a trade deal. If nothing else, a deal should prevent the near-term imposition of higher tariffs. Other data out recently, not least Korea's trade figures for January, show that this is not just a China issue, but a regional one. In Korea's case, the tech cycle is also probably playing a stronger role, though China also has its own issues in this sector. 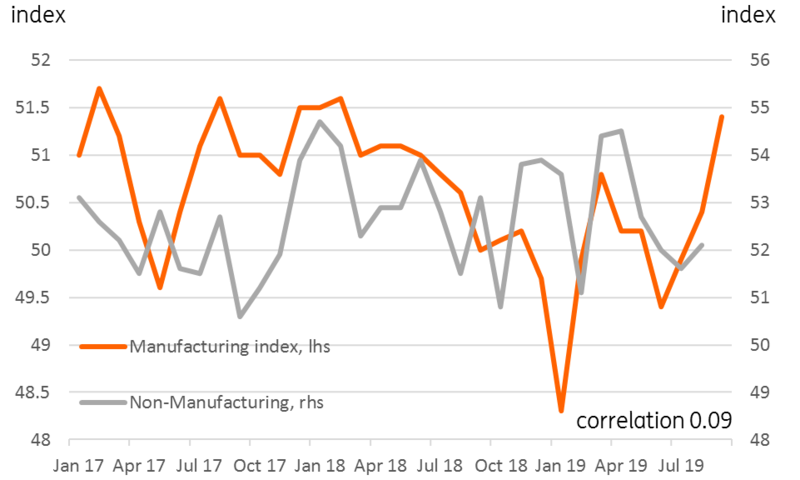 In contrast to yesterday's official PMI release, where the headline was surprisingly upbeat, but most of the subcomponents were worrying, there were some bright spots in the underlying components for the Caixin index. According to the Bloomberg account of the report from Markit, business confidence was at an eight-month high and new export orders had also rebounded following the trade truce. That said, the output index fell into contractionary territory and overall new orders (in other words, adding in domestic orders to new export orders) were their lowest since September 2015, which suggests that the domestic economy itself must be in pretty bad shape. The dichotomy between the official and Caixin PMIs is really a dichotomy between the large state-owned and domestically focussed firms supported by bank lending and PBoC monetary and credit stimulus measures, and the smaller, more externally focussed private sector. Here, non-bank lending is more traditionally used to finance activity, and this is where current stimulus measures seem to be failing, and previous deleveraging measures still dragging down activity. This is not going to be an easy problem for the authorities to solve. As China has become larger, richer, and more complicated, it is becoming harder for the authorities to fix all problems by diktat. Market mechanisms as solutions to these problems are still inadequate in some areas, as this survey highlights.